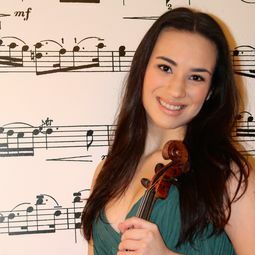 Ana Teresa de Braga e Alves started learning the viola in Portugal at the age of 5 concluding high school with distinction Academic, Music and Artistic Merit Awards in 2012. Currently she is in the 1st year of her Masters in Performance Degree at the Royal College of Music as an RCM Barry Shaw Scholar, holder of a Help Musicians UK Postgraduate Award and St Marylebone Education Foundation Scholarship under the supervision of Andriy Viytovych. In 2016 Ana concluded her Bachelor of Music Degree (Honours), First Class, on the same establishment under the supervision of Jonathan Barritt and Ian Jewel. Ana has performed extensively solo and with orchestra in the most renowned halls in Portugal, London and the Steinway Hall HUG in Switzerland as part of the Cully Classique Musique Festival and in Italy as part of the Lucca Classica Music Festival. Ana’s learning process as a musician also includes numerous masterclasses with renowned musicians, the Youth Orchestra of Portugal, major conductors such Sir Roger Norrington, Bernard Haitink and Vladimir Jurowski, English National Opera Scheme, solo performances with Portuguese Orchestras, 1st Prizes in National Portuguese Competitions, Annual Piano Chamber Competition, String Quartet Competition at the RCM, and the Boconnoc Music Award. Sinds kort maakt ze deel uit van het BEHN QUARTET dat op zondag 4 november 2018 optreedt in de kerk van Mook.